Garment Manufacturing Technology provides an insiders' look at this multifaceted process, systematically going from design and production to finishing and quality control. As technological improvements are transforming all aspects of garment manufacturing allowing manufacturers to meet the growing demand for greater productivity and flexibility, the text discusses necessary information on product development, production planning, and material selection. 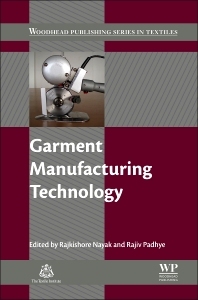 Subsequent chapters covers garment design, including computer-aided design (CAD), advances in spreading, cutting and sewing, and new technologies, including alternative joining techniques and seamless garment construction. Garment finishing, quality control, and care-labelling are also presented and explored. R&D managers in the textile industry, postgraduate students and academic researchers in textile science.